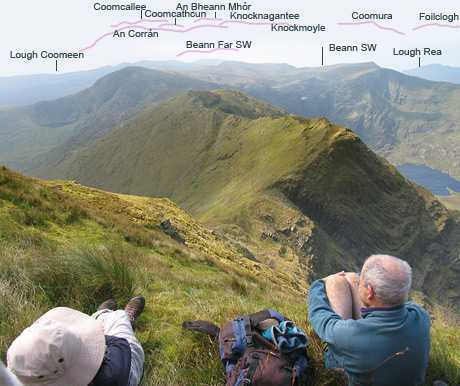 Beann SW Top is the 182nd highest place in Ireland. Beann SW is part of a ridge leaving the Mullaghanattin circuit towards the SW and heading towards An Corrán (aka Finnararagh), Knocknagantee and eventually Coomcallee. It's an exciting spur surrounded by interesting features. It would be inadvisable to descend off it to the north because of extremely steep ground and cliffs though it is possible to get down the SE side. 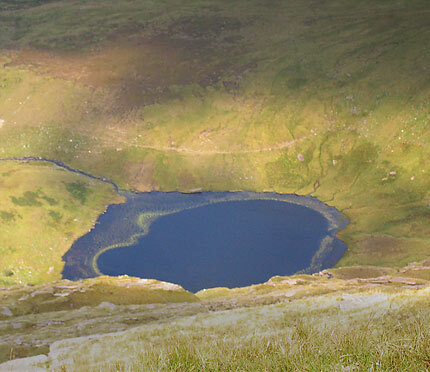 It can be reached as an excursion while doing the Mullaghanattin circuit or part of a circuit of Cloon Lough. It's easy enough to reach it from Beann S Top.